In feng shui clocks are used to bring greater attention to time. Clocks help us connect to the rhythms of nature and synchronise with other people. They add movement to a room and help us structure our day. Clocks remind us of the seconds ticking by, marking out the passage of time, as we trade our youth for wisdom. Clocks were one important way to create synchronicity among communities. Clocks encourage people to arrive to work together at the same time, to be the means for people to meet at the same time, to arrange mass travel by trains. Similar to a shoal of fish turning at the same time, or a flock of bird changing direction together, clocks give us a means to take action at the same time. In a way clocks have become the conductor of a worldwide orchestra. Clocks played their part in ushering in the industrial age, providing the organisational heartbeat. In a sense clocks keep us connected to the rest of our race. In one way clocks simply provide a more detailed and accessible expression of nature and her cycles. We have a certain rhythm through the days, lunar phases and seasons. 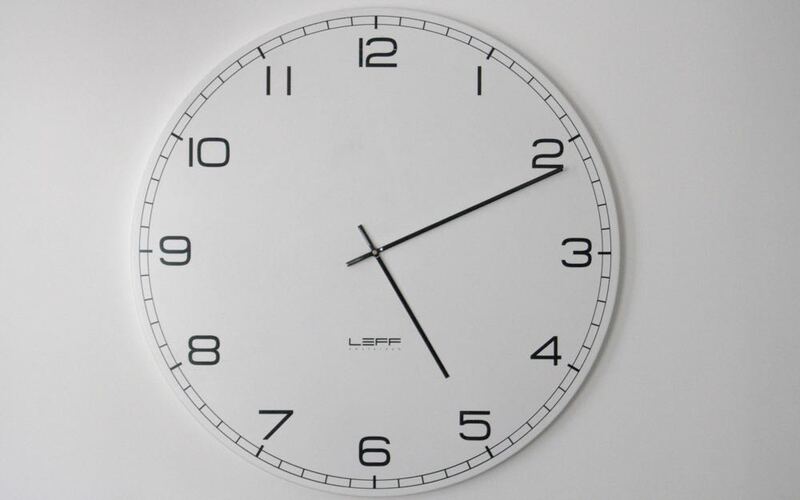 The day cycle is divided into segments and displayed through the design of clocks. In feng shui clocks introduce movement and motion to a room. This is most obvious with a pendulum clock, however, modern electric clocks often have a colourful second hand marching around the clock face. It is often a clock that is the only item moving in an otherwise static room, rather like eyes gently blinking on a peaceful face. By taking something that is analogue, like the slow movement of the minute and hour hands, and turning it into something digital, like the rhythmic jump of the second hand we create a rhythm. A pendulum clock will do this more obviously. Sometimes having rhythm in our lives and homes helps us be more organised, functional and structured. The metronomic ticking of a clock adds sonic rhythm to a space, sending repeating waves of vibration through the air and through and energy of a room and the people in it. Time can be displayed in numbers or by the relative position of two lines. The numbers create a digital precision whilst the hands describe time in continual flow. Do you prefer the crisp accuracy of a digital display or do you like the iconic moving form of two hands? Clocks used to be prevalent throughout the built environment. The clock in the high street, the big central clock in the railway station, clocks in shops, the café timepiece, grandfather clocks at home, the ornate jewelled decorative piece on the mantelpiece. Watches have for many generations been mans display of decoration. The pocket watch and the wristwatch have symbolised status, taste and style. Men have identified themselves by their choice of mechanism to represent father time. Now they are being replaced by the time on mobile phones. The time appears as an accurate digital display at the press of a button. Clocks are disappearing from public display in our homes, shops and streets. Perhaps some of our awareness dissolves with it as we no longer need to wind, adjust and synchronise our timepieces. The structure, rhythm and tempo that clocks offer mean they could be described as being more yang and having more of the five element chi of metal. A clock might therefore help bring more of that yang, metal chi associated with organisation, planning ahead and synchronisation, to a room. A large clock with audible ticking sounds and pendulum would accentuate its rhythm and motion. However, any kind of clock will be symbolic of time keeping. If you want to create a space that is more supportive to being organised and better able to work with other people, perhaps a clock will help you. If so, in five element theory, the best place for a clock would be to the west, north-west and north parts of your home, office or room. Alternatively, you could use your intuition and simply place the clock anywhere that feels appropriate to you. When choosing feng shui clocks spend some time finding one that you can best connect to, in terms of colours, shape, sound, design and style. Simon is available for online and in person feng shui consultations, to help create homes and businesses that best support success. Call 07543663227 or email to discuss how to use feng shui.